Make ART Work is a professional development program for working artists. 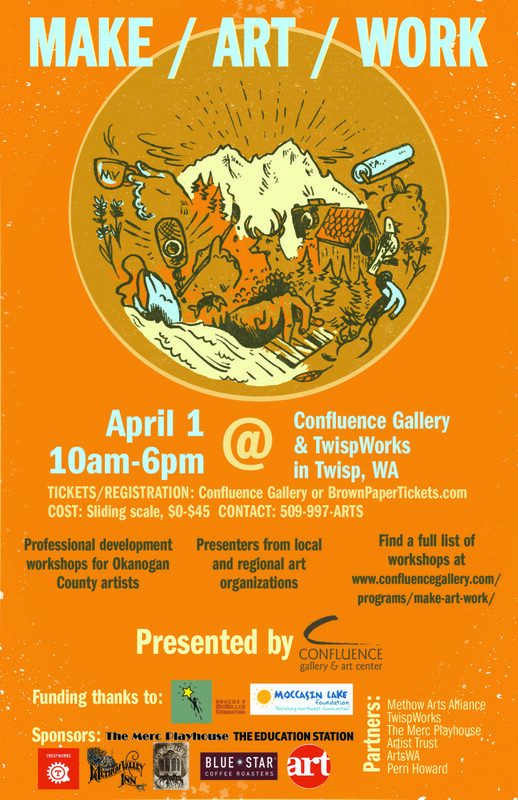 Confluence Gallery presents a day-long event featuring workshops, panels and presentations to teach skills useful to artists practicing in all disciplines and at all levels of their career and help artists implement these strategies into their everyday work. This event will bring instructors from across the region to teach topics within their expertise to artists in Okanogan County. The community will be invited to join our artists for a reception in the gallery and a free “Powered by PecheKucha” evening performance at the Merc Playhouse that will explore “Art Got Me Here”. Presenters include Jenny Hyde and Katy Hannigan of Artist Trust, Lisa Jaret and Natasha Ransom of ArtsWA, Amanda Jackson Mott of Methow Arts Alliance and Salyna Gracie of Confluence Gallery. Make ART Work is made possible by generous grants from the Robert B. McMillen Foundation and the Moccasin Lake Foundation. Partner organizations are TwispWorks, The Merc Playhouse, and Methow Arts and Jody Bento of Seattle Art Museum. Make ART Work is generously sponsored by Methow Valley Inn, Blue Star Coffee Roasters, KTRT and other local businesses. CGAC seeks to cultivate a vibrant community by connecting artists with the skills, information, and services they need to make a living and a life as an artist in rural Eastern Washington State. CGAC believes that fostering artist success will build vitality beyond the arts community and into the region at large.